Home » First 'Image' of 'Black Hole' Teases Imagination: What's Mankind's True Potential in Space? First image of a black hole, captured by the Event Horizon telescope. The Event Horizon Telescope (EHT) released the first-ever image of the environment immediately surrounding a super-massive black hole candidate (located at the center of galaxy M87). This provides the first1 It should be noted that other lines of evidence have supported the existence of astronomical phenomena with event horizons, including the LIGO gravitational wave detections. direct visual-observational evidence of the physical existence of an event horizon — a physical boundary condition delineating a mysterious physical regime where the gravitational conditions are so intense even light cannot escape. These first images of this anomalous physical regime provide a critical reminder to mankind: there is still so much to discover and understand about our Universe, we need to get off this small planet to continue to explore and expand our understanding—and President Trump's Moon-Mars program provides a historic opportunity to take the next steps in fulfilling our shared, uniquely human destiny. No one knows what actually happens within these mysterious regimes (beyond the event horizon), but, now, we do know that their existence isn't mathematical speculation--it is a physical reality. The environment immediately surrounding an event horizon is the most extreme expression of Einstein's general relativity mankind has ever investigated--with gravitational spacetime conditions so intense light can orbit the event horizon (as if the light were a satellite orbiting a planet). According to the scientists from the National Science Foundation who presented the first EHT images on April 10, the unique characteristics of this environment surrounding the event horizon at the center of M87 correspond beautifully to what was predicted based on Einstein's theory. The first EHT images are the product of an incredible international initiative, involving hundreds of scientists, dozens of institutions, and ten radio telescopes across eight sites around the world (connected together to operate as a single dish, through very-long-baseline interferometry). And the EHT is just getting started, additional telescopes are being brought into the project, and the EHT will move into observations at slightly higher radio frequencies--both of which will contribute to sharper images of their two main observational targets, the event horizon at the center of M87, and also the event horizon at the center of our own Galaxy (Sag A*). Additionally, scientists involved are noting that space-based satellites would be the next step, to further increase the potential of the EHT. These supermassive phenomena at the centers of galaxies represent critical anomalies. Not only is the physical regime beyond the event horizon a mystery, no one exactly sure how or why these supermassive phenomena form at the centers of galaxies. Every galaxy seems to have one, and their mass systematically scales in correspondence with the size of their host galaxy—a relation no one can explain. They can be "active," becoming the most energetic astronomical phenomena out there--shining brighter than their entire host galaxy, and emitting coherent and structured jets of plasma that can be larger than the galaxy. The EHT is helping to open the door to many fascinating anomalies, but this is just the beginning. Mankind's future requires the continued pursuit of these fundamental questions, and this pursuit requires initiatives like President Trump's Moon-Mars program. 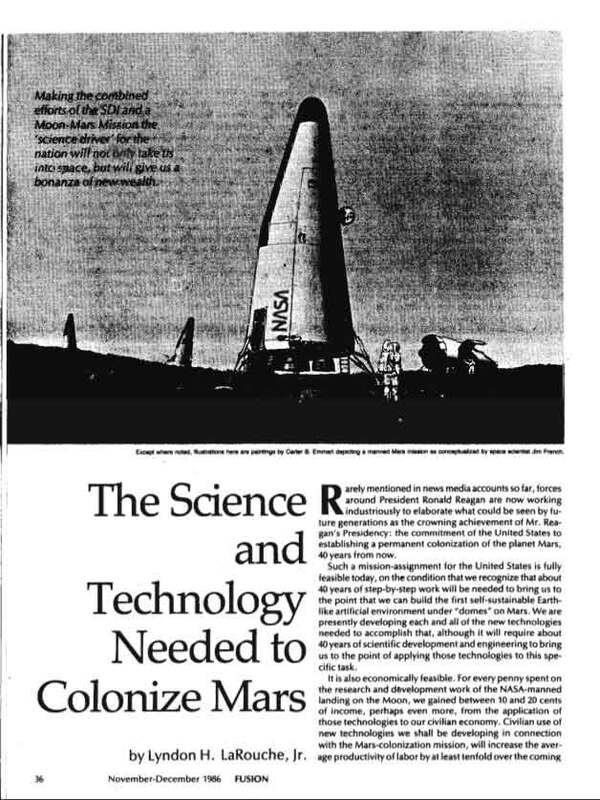 In 1986, Mr. LaRouche addressed this beautifully in his own outline for a 40 year perspective of a Moon-Mars colonization program, "The Science and Technology Needed to Colonize Mars". "The astronomers are the first to tell us why we must go some distance away from Earth's orbit. The Earth's atmosphere prevents us from observing the full spectrum of radiation from the stars and galaxies, and we have reached near to the limit of what we can discover about our larger universe by Earth-based observatories. We can do a little better with telescopes and radio telescopes in near-Earth orbit, but for many important measurements, the area in the vicinity of the Earth's orbit is a very dirty and noisy place. We must be able to measure the full range of the spectrum of electromagnetic radiation in space, from the very long wave to the very, very short: from every distant star, galaxy, and other phenomenon to be observed. "Building observatories as far out as Mars orbit, and beyond, will make young astronomers very happy, but our purpose for spending these many billions of dollars is obviously not merely to give astronomers some special sort of personal pleasure. The point is, with aid of such observatories, our astrophysicists will be able to answer many questions very important for life on Earth, questions which can not be answered without information from such complexes of space-based scientific observatories. "The history of ‘anomalies’ is the history of fundamental progress in science. Modern science began with the work of Nicholas of Cusa. In 1440, Cusa published a book, On Learned Ignorance (De Dacia lgnorantia) which accomplished, chiefly, two things. Cusa presented a discovery which modern science calls the Principle of Least Action, and which mathematicians refer to as the isoperimetric theorem. Cusa proved that geometry, as then taught, contained a fundamental error, and that this error had a bad effect on our thinking about physics. In the same book, Cusa presented a way of thinking about physics which set the stage for the later work of such leading figures as Leonardo da Vinci, Kepler, and Leibniz. Every step of fundamental progress in experimental science since has centered around discovering mistakes, called ‘anomalies,’ in generally accepted scientific doctrines. "By about the middle of the 19th century, with the work of Karl Gauss and his collaborators, science developed a more effective way of looking at this problem of ‘anomalies.’ It was established as a rule, that to settle any fundamental principle of physics, we must move away from the everyday scale of experimental work, and study the way in which the universe behaves at its extremes, the very, very large and the very, very small. In other words, we can not say that any physics principle is true experimentally, until we have proven that principle by means of astronomical observations and also on the size-scale of molecules, atoms, and subatomic behavior. "It has also been recognized, off and on, since the work of Leonardo da Vinci, that we must also prove principles of nature in a third region of physical experiments and observation: living processes. Today's progress in optical biophysics is reminding us of that, once more. "In brief: The practical importance of astrophysics for life on Earth is that without the special kind of knowledge of laws of the universe we gain from astrophysics, we are blocked in scientific progress on the scale of everyday practice. Astrophysics, microphysics, and optical biophysics, are the frontiers of all scientific progress on Earth today. "To explore the behavior of the stars and galaxies, we must measure the full range of radiation from those sources. We must measure not only the visible light, but also microwaves and radio frequencies, the very large infrared spectrum, the ultraviolet, the X-ray region, and so forth. The farther from the Sun we make those observations, the better. What we are searching for is "anomalies" in our present textbooks' physics. We are searching for the kind of evidence, which compared with work in microphysics and optical biophysics, will enable us not only to uncover those ‘anomalies,’ but to solve them. "The rate at which science progresses on the surface of the Earth depends very much on these kinds of coordinated investigations. "A considerable amount of benefit can be gained from unmanned observational stations placed in various locations around our solar system. More and more, we are faced with the fact that there must also be manned laboratories and manned observatories in space, as well. "So far, most of our space exploration has been based on these kinds of objectives. This will continue to be a large part of man's work and life in space for the foreseeable decades ahead. "Once we move to place observatories and space laboratories at interplanetary distances, the idea of permanent colonies in space pops up. Once we think of putting a few dozen scientists and technicians at interplanetary distances, we are already raising the question of space colonization. "The logic of the problem is simple enough. To support a few dozen scientists and technicians in the ‘front line’ missions of research in space, we must have a much larger number of people there to maintain the life-support systems on which those scientists and technicians depend. As soon as one has sketched the table of organization for the persons necessary simply to maintain those life-support systems, we realize that once we have decided to put a few dozen scientists and technicians into front-line space missions, we might as well put a few hundred such scientists and technicians out there. The size of the life-support staff needed to sustain a few dozen scientists, would actually support hundreds with relatively little more effort. "Once we have decided to put observatories and laboratories a significant part of the distance toward Mars-orbit, we see it is much better to go all the distance, and take advantage of the fact that Mars is the most convenient place to establish a logistical base for the more remote stations. "Once that point is settled in our minds, we must estimate the minimum population on Mars necessary to maintain all functions indispensable to life support on that planet. Even with continued logistical support from the industrial base on the Moon, we are in the range of a city-sized population in our initial Mars colony. We must stop thinking in terms of the word base, as we might say ‘Antarctica base’; the word we must use i s permanent colony, a chiefly self-sustaining, permanent colony on Mars. "We might look at the project in this way. Think of it as recruiting several thousand scientists, and supporting research technicians, to staff the major U.S. laboratory in space research. However, instead of establishing this university-like research center in the middle of Arizona, we place it on Mars . To provide the goods and services the scientific teams and their families require, we develop a small city around the research center, analogous to the case of Los Alamos. "This population is composed of human beings, not robots, and also not fellows clomping around in space suits in some Hollywood science fiction sort of space opera. Without a human ecosystem, many of them would go mad, or nearly so. Building an atmosphere on Mars so that the colonists could bicycle or hitchhike around the planet's highways, might be a bit far fetched for the foreseeable future; cities and farms in Earth like artificial environments, under large domes, is the more likely prospect for the foreseeable future. With in such domes, human activity and environment must be as Earthlike as possible. Think of a similar center placed in the middle of the Sahara Desert: pretty bleak and unlivable outside the oasis under the air conditioned dome." For more on LaRouchePAC's scientific perspective on "supermassive black holes" see Ben Deniston's 2016 class, 'Galaxy Project VI: Singularities and Anti-Entropy'.